Repairer who lost home in Camp Fire, CIF promote industry Christmas dinner in Calif. The Collision Industry Foundation on Tuesday sought donations to organize a Christmas dinner and presents for the industry professionals and children affected by the Camp Fire in Northern California. Pearson Road Collision Repair general manager Becky Rogers proposed the idea of inviting all of the region’s collision professionals to a Christmas meal after losing both her home and, at least for now, her job in the blaze. After her own losses, she has “worked tirelessly with the CIF to identify and validate those in need in our industry,” according to the organization. CIF gives aid to professionals and families in the collision repair ecosystem after disasters, including providing tools so techs can work. The Camp Fire in Northern California destroyed 13,972 homes, 528 businesses and 4,293 other buildings, according to Cal Fire. It killed 86 people and injured three firefighters. 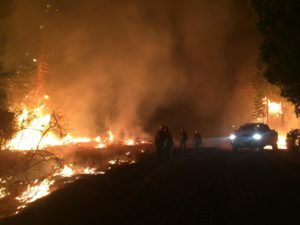 “Many industry professionals are either camping in tents, in shelters or living in cramped quarters with relatives,” CIF wrote. 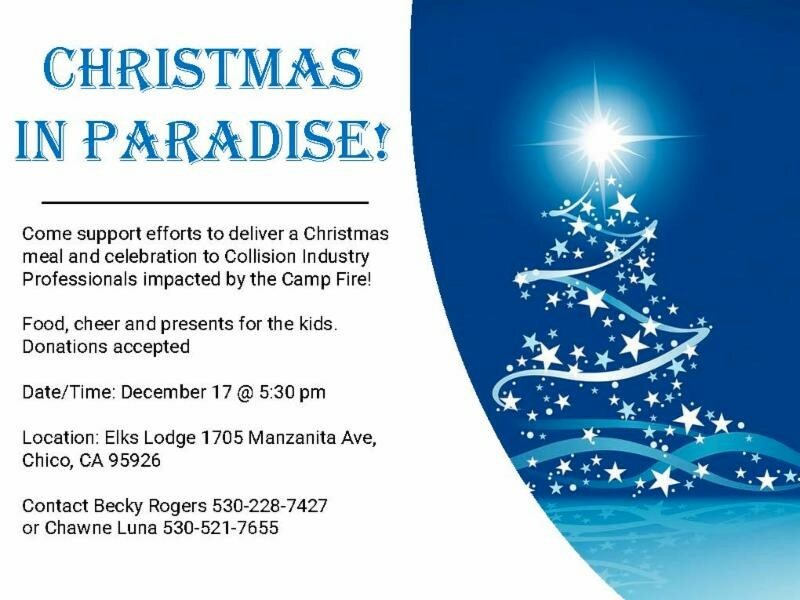 More than 150 people are expected to attend the “Christmas in Paradise” dinner, scheduled for 5:30 p.m. PT Dec. 17 at the Elks Lodge, 1705 Manzanita Ave, Chico, CA 95926. RSVP or sponsor a family by contacting Rogers at 530-228-7427 or Luna at 530-521-7655. Those affected by disasters like the California fires or this year’s hurricanes can request aid themselves online, email collisionindustryfoundation@gmail.com or call 855-424-3243 or 804-427-6982. Donate to CIF here. Also, don’t forget that the Collision Industry Foundation is on Amazon Smile. If you designate them as your charity and buy stuff on smile.amazon.com instead of the regular Amazon website or the app, the retail giant will donate a little bit to the foundation every time you buy one of millions of designated products. Another repairer impacted by the fire had success organizing a separate relief effort for his staff. Collision Pros owner Brian Von Tress’ GoFundMe page brought in $36,200, exceeding the $30,000 he had sought for his team. He said in a Nov. 12 interview that at least seven of his eight employees’ families were confirmed to have lost houses in either Paradise or nearby Chico, Calif. 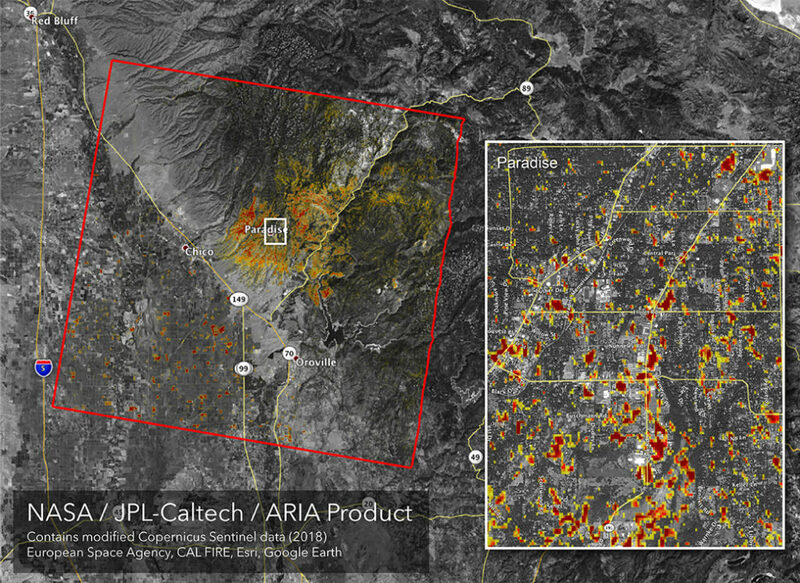 The four-shop company’s Paradise, Calif., location was destroyed by the fire as well.